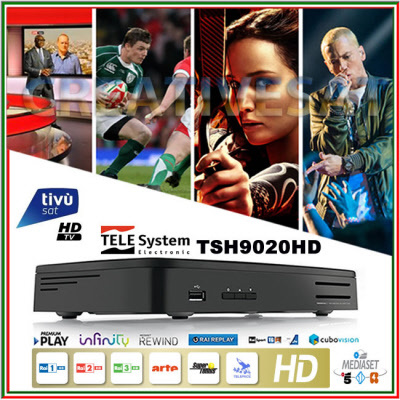 TivùSat HD TeleSystem TS9020 HD Twin Tuner PVR is the new PVR Satellite HD Digital TV service for Italy, includes Smartcard and Official HD Digital Twin Tuner Set-Top Box. No monthly subscription required. To be able to use the full recording functions of the Twin Tuner USB PVR Ready you will need a suitable external Hard Drive and a Twin LNB installed with 2 satellite cables. You can still use the PVR Recording functions with 1 x satellite cable but only as a single tuner decoder. 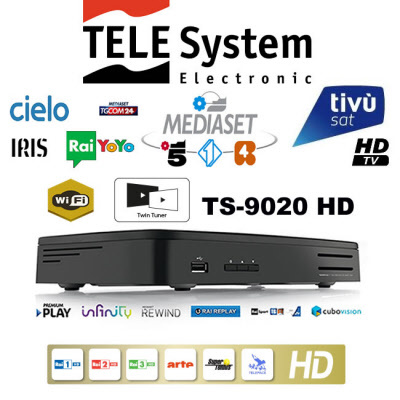 With TS9020HD can benefit from the new On Demand services such as Mediaset Rewind, Replay Rai, Rai Sport, La7 On Demand and Cube Vision. PLEASE NOTE, SOME STREAMING SERVICES SUCH AS INFINITY & POSSIBLY OTHERS MAY NOT BE AVAILABLE OUTSIDE OF ITALY. Please note that the TivuSat smartcard will require activation ( Not included) . 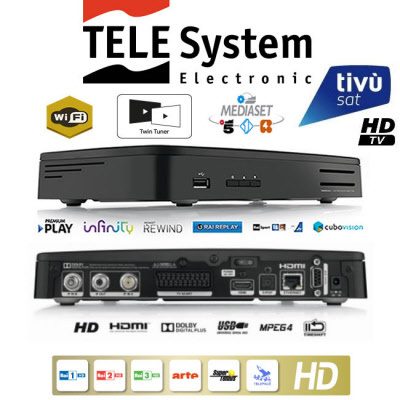 Tivùsat ( TeleSystem TS9020 HD) is the first Italian free to air satellite platform, therefore viewers can access all the Italian channels and a huge line up of national and international channels. 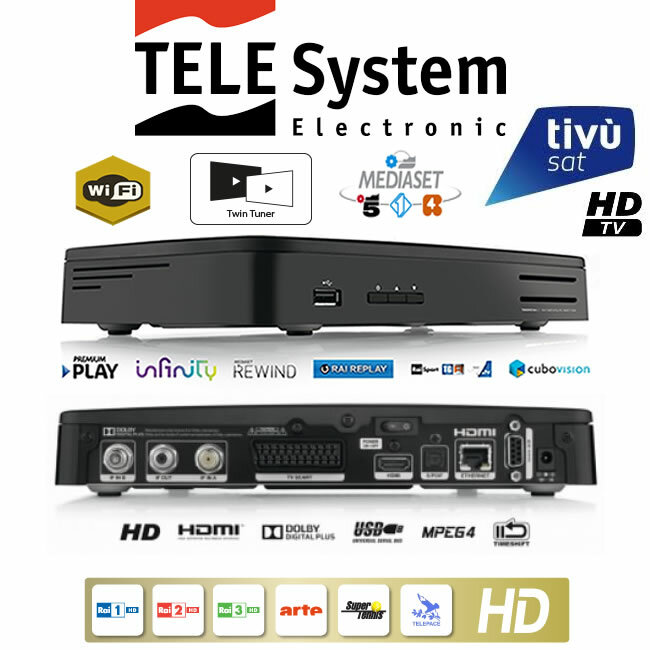 Tivusat HD is the new digital TV service for Italy, includes Smartcard and HD digital Tivusat decoder/receiver. No subscription required. This package will allow you to watch all the Italian TV channels even when scrambled during movies and other sport events. With tivùsat, you will have free access to the traditional Italian mainstream television offer (Rai Uno, Rai Due, Rai Tre, Rai 1 HD. Rai 2 HD, Rai 3 HD, Canale 5, Italia 1, Rete 4, La 7, Cielo) without any dimming of the schedules, to the new digital television channels (both National and local) and to the most important international channels. tivùsat is a wide window on the world of entertainment, information, culture, sport, fiction and show business and the number of accessible channels is are constantly growing and able to satisfy the preferences and tastes of all viewers. As well as replicating the complete programming the majority of the National channels broadcast on the digital terrestrial platform, tivùsat ‘ s offer includes the most important Italian and international channels. 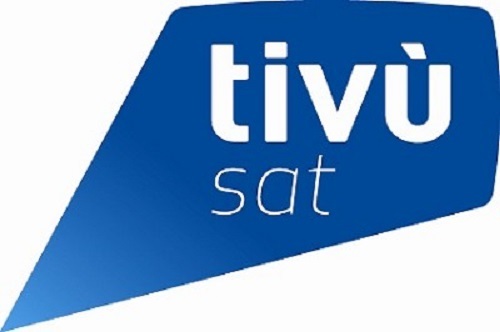 A constantly updated list of tivùsat channels can be seen on the tivùsat website’s home page. * The Tivusat Card is NOT activated. To watch the Tivusat channels you will require to activate yourself the Tivusat Card.The activation of the TivùSat HD smartcard requires a valid Italian address and Codice Fiscale , you can click on Tivusat Website here…. and proceed with the activation. We can activate the card on your behalf Free of Charge ( Gratis ) if you supply us the full details required for the registration .. If you cannot supply us with the Italian details required we can activate the card for you however there is a £75.00 activation fee for this service . The TivuSat smartcard is valid for a minimum of 2 years..
TiVuSat broadcast from Hotbird 13″ East , you will require a 60/80cm dish kit to view TiVu Sat. Channels are subject to change without notice by the broadcaster.This viewing card is offered for Domestic Use only.